April 2014｜Sumitomo Electric Group Citizenship Activity "Smile Relay"
Hello. I’m Minako Suzuki of the CSR/Corporate Citizenship Office at Tokai Rubber Industries. I feel that until quite recently I appreciated cherry blossoms in full bloom, but now I enjoy cozy early summer weather. Today, I’d like to introduce a preschool preparation class for foreign children who live in Komaki, Aichi, and will soon be enrolled in elementary school. 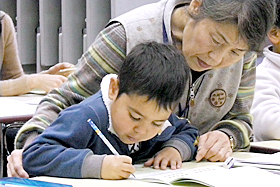 This program is designed for such children to adapt to Japanese school life as early as possible, by helping them to acquire the Japanese reading and writing skills necessary for school life and to understand the basic rules to be followed at school. This program is provided with the cooperation of Komaki International Association and Tokai Rubber Industries, a member company of the Sumitomo Electric Group, with the aim of developing young people in the area where the company’s head office and Komaki Plant are located. Held right before the school enrolment season, the program marked its 4th anniversary this year. 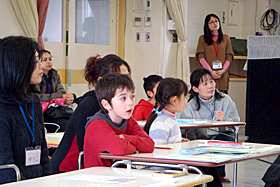 Due to a lack of Japanese proficiency, many foreign children cannot follow classes, leading some such children to refuse to go to school. In this regard, it is necessary to offer detailed care and attention so that they can adapt to Japanese school life smoothly. Prior to the program, volunteer citizens had participated in an instructor training course held from summer to winter. As preparation for the program, they had learned appropriate instruction methods and tips on creating useful class materials. At this year’s program, on Saturdays from January to March, a total of 31 children from seven countries, such as Brazil, the Philippines and Peru, participated in nine to ten classes provided by a total of 18 instructors at nursery schools and other facilities in the city. Using books or posters that they had made on their own for class, the instructors gave the children very careful instruction. 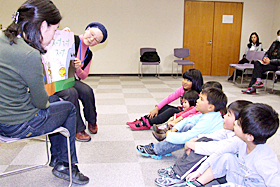 On top of learning hiragana pronunciations, the stroke order when writing hiragana, and how to read a clock, the children enjoyed listening to instructors reading picture books out loud. The classroom was always filled with the smiles of children who could hardly wait for the start of their school lives. 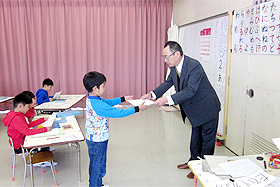 ▲Child receiving a certificate of completion at the “graduation” ceremony. It seems that the children have all become somewhat stronger. Meanwhile, I hear that children who “graduated” from this program have adapted to their school lives, studying hard and playing energetically every day. I also hear that their parents are happy that thanks to the program, the children converse in Japanese more frequently than before and that they have made a lot of friends. We would like to continue this program, which will make many more children smile, and contribute to making their school lives more cheerful, and ensuring their sound growth. Tokai Rubber Industries, Ltd. (headquartered in Komaki City, Aichi Prefecture) will celebrate its 85th anniversary in December 2014. Based on high-polymer rubber compounding technology, the company manufactures and sells automobile parts including anti-vibration rubbers, in which the company boasts the world’s top share, as well as general industry items, including precision parts for IT equipment and high-pressure hoses for construction equipment. Recently the company has been expanding its business portfolio into the fields of earthquake countermeasure equipment, heat insulating window films, and long-term care support goods for elderly people. Utilizing its network covering 102 bases in 24 countries around the world, the company aims to secure a stable supply of high quality products all over the world, thereby realizing its mission as Global Excellent Manufacturing Company.